Phillip Walker's latest release is further proof that there exists such a thing as "The HighTone Sound," previously exemplified on albums by Robert Cray and Joe Louis Walker. This style of pop-blues is just as distinctive in its way as "the Motown Sound" brand of R&B was in the '60s. The shapers of the HighTone Sound  which is characterized by guitar- and vocal-based songs built around thick funk rhythms  are label house producers Bruce Bromberg and Dennis Walker. The HighTone Sound is further identified by the infectious, pop-oriented melodies with more hooks than a fishing lure. 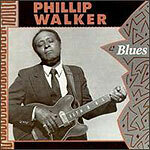 For Phillip Walker, as for Cray and Joe Louis Walker before, many of these songs are provided by HighTone stable writers Dennis Walker and D. Amy. True to form, the strongest songs on "Blues" are those from Dennis Walker and Amy. "Don't be Afraid of the Dark" (made a hit by Cray, although this version was reportedly recorded a day earlier) is a smooth, R&B-based tune. The tight horn arrangements underscore Phillip Walker's smooth tenor voice and unique, metallic sound on guitar. Unlike Cray and J.L. Walker, Phillip Walker's guitar playing doesn't stray into rock. His cuts are more restrained, more refined. His best guitar work is on "Sometime Girl," a low-down gritty blues piece a la Koko Taylor. An intensity not seen elsewhere on the album seems to drive every solo on this cut. Jimi Stewart's electric piano picks up where Walker lets off, and the combination makes for a hot four minutes. Walker finds his way into a hotter, more contemporary Chicago-style blues on "How Many Years" and "Talk to That Man," and strays even further back on a traditional blues by Amy, "90 Proof." But his versatility is displayed on the Motown-modeled "I Had a Dream." The Memphis Horns (Andrew Love and Wayne Jackson) are always tight, never obtrusive. That same approach is followed by bassist James "Broadway" Thomas and Johnny Tucker.